The role of the physician assistant is a fast-growing occupation in the United States, and it is a profession that is critical for the advancement of healthcare. Learn how to become a physician assistant – from the education requirements down to the top attributes physicians seek in physician assistants – and decide whether this is the right career path for you. Before getting started with how to become a physician assistant, learn about the history of the role and the kind of work it involves. According to the American Academy of PAs (AAPA), a physician assistant, or PA, is a nationally certified and state-licensed medical professional who diagnoses illnesses, develops treatment plans for patients, prescribes medication, and can often serve as a primary care provider. Physician assistants practice in every state and work in a variety of medical settings and specialties. The National Commission on Certification of Physician Assistants (NCCPA) reports that there are more than 115,500 certified physician assistants in the nation. The role of the physician assistant was established in the 1960s, when physicians and educators recognized there was a shortage in primary care providers across the United States. The PA program was created at Duke University, and the inaugural class graduated in 1967. Since then, the physician assistant role has celebrated many milestones, including being named in the 2010 Affordable Care Act as one of three healthcare professionals who provide primary care in the U.S. (Physicians and nurse practitioners are the two other professionals). The profession is celebrated every year on National PA Day (Oct. 6), as well as during PA Week (Oct. 6-12). A physician assistant is one of the most important careers in the medical field; it’s a diverse role that combines a variety of skills to help clinics, hospitals, and other medical settings progress in the right direction. As you learn how to become a physician assistant, become familiar with the duties and expectations required of the profession. As the name implies, physician assistants help doctors, surgeons and other healthcare professionals with various tasks. 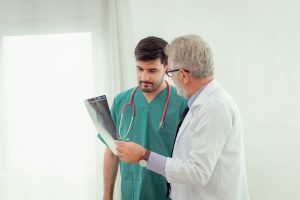 In fact, under current laws and regulations, physician assistants must have an agreement with a specific physician in order to practice (the AAPA is attempting to change this based on the profession’s proven role as a trusted health care provider – details here). Just like any job in the healthcare field, the role of physician assistant is both demanding and rewarding. PAs must hold themselves to the highest standards of medical practice to deliver the best care possible to their patients. Advanced education is required in order to become a successful physician assistant. To start, prospective physician assistants should earn a bachelor’s degree. While technically any major will suffice, pursuing a degree in health science provides a helpful foundation. Students in such a program may take courses like Statistics, Healthcare Ethics, Medical Terminology and Quantitative Methods, according Learn How to Become – all topics that will be referenced throughout a PA’s schooling, training and career. Many college graduates interested in the PA profession go on to pursue a master’s physician assistant program, which includes both classroom and clinical instruction. Topics covered in courses include Anatomy, Physiology, Pharmacology, Medical Laws and Ethics, Clinical Medicine, and Pathology. Prospective physician assistants who want to accelerate completion of their education requirements can instead choose to pursue a rigorous physician assistant direct entry, dual degree program, simultaneously earning a bachelor’s degree and graduate-level PA certificate. Whether a student decides to pursue a four-year undergraduate degree followed by a master’s physician assistant program, or an accelerated learning path, there are key considerations to keep in mind when applying to a PA program. Stephen Pasquini, creator of the website The PA Life, advises anyone interested in eventually becoming a physician assistant should seek out opportunities to work or volunteer in the healthcare field in some way. Not only will doing this assure you that a career in healthcare is for you (or, perhaps, that it’s not for you…), it will provide you with experience, connections, and reference letters to get accepted into a PA program. Pasquini’s advice is helpful both for young, prospective PAs (like high school seniors and college freshmen and sophomores) to start gaining experience as soon as they decide they may want to pursue this profession, as PA school application is highly competitive. The AAPA adds that for many programs, experience with hands-on patient care is a must, and that most PA school applicants have an undergraduate degree and approximately three years of healthcare experience before entering a program. Peace Corps volunteer, among other roles. Another tip from Pasquini is to create an account with the Central Application for Service for Physician Assistants (CASPA) early on in your research of PA program. Doing so allows applicants to look into prerequisite requirements for PA schools across the country, as well as familiarize themselves with additional documents required for application. Pasquini also strongly suggests that prospective PA school applicants become certified in some basic healthcare training programs, like basic life support, CPR and HIPAA. Advanced certifications and training that help with PA school applications and overall medical career including phlebotomy and medical terminology, among others. Once you have applied to PA programs, Pasquini’s last pieces of advice are to prepare for your interview (be yourself and be ready to share about all your experiences that led to this moment, he writes) and, finally, to celebrate your acceptance into what is hopefully your choice PA school. The path to completing PA school requires more than coursework and previous healthcare experience. Many physician assistant programs include more than 2,000 hours of clinical rotations. Upon graduation from a PA program, prospective physician assistants are eligible to take the Physician Assistant National Certifying Exam (PANCE), which is administered by the National Commission on Certification of Physician Assistants. 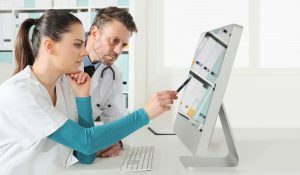 Passing the PANCE and maintaining certification means PAs can use the title Physician Assistant-Certified, or PA-C. To maintain national certification, PAs must complete 100 hours of continuing medical education (CME) credits every two years, and take the Physician Assistant National Recertifying Exam (PANRE) every 10 years. Along with graduating from an accredited PA school and passing the PANCE, physician assistants must become licensed in the state they will practice in before they can start their careers. State licensure requirements vary by state, which you can learn more about here. Schooling, healthcare experience and clinical work are all critical topics when considering how to become a physician assistant. One must also think about how personality and other character traits play into a successful career as a physician assistant, as it is a demanding profession in the challenging and ever-changing medical industry. Curiosity: PAs must be committed to learning on the job, especially when taking on rotation that they may have little to no experience in, in order to sharpen their skill sets and increase their flexibility working in different medical settings. Physicians assistants should also seek out ways to learn about the latest advancements in medicine and medical technology and be willing to adapt as needed. Empathy: As with any patient-centered role in the medical field, being kind and empathetic is critical to gaining a patient’s trust and fostering a relationship that contributes to better and more effective care. Honesty: To err is human, and it happens to even the most meticulous of physician assistants. However, lying to cover up a forgotten exam or another oversight to avoid embarrassment can put both the patient and the practice, hospital, or other setting at risk. Put honesty and the patient’s care above all else, including your pride. Availability: Healthcare is a 24/7 industry. Emergencies happen – and often – and they must be addressed immediately, no matter what time of day it is or if it is a weekend. Physician assistants must be ready for the unpredictable demands of the medical field and be able to navigate the industry’s peaks and valleys. Drive and commitment: Doctors tend to be hardworking, competitive and driven people, and physician assistants should mirror the commitment of their supervising physicians. Successful physician assistants understand the importance of holding him or herself to a level of professional performance no less than his or her absolute best. Find out more characteristics that make for exemplary physician assistants. What is the Difference between a PA and an NP? Physician assistants are trained in general medicine, providing a comprehensive overview of all aspects of medicine. On the other hand, nurse practitioners choose a population focus, like practicing as a pediatric nurse practitioner, family nurse practitioner, or a women’s health nurse practitioner. Physician assistants are trained to practice medicine and PA school programs are modeled on medical school education, whereas nurse practitioners are trained in the advanced practice of nursing. Learn more about the role of a nurse practitioner and the differences between physician assistants and nurse practitioners. Those considering how to become a physician assistant have a promising future ahead of them. Like many roles in the medical field, physician assistants are in demand as the population ages and the need for quality healthcare – not to mention more primary care providers – is on the rise. According to the Bureau of Labor Statistics (BLS), employment of physician assistants is expected to grow by 37% by 2026, which is much faster than the national average for most occupations. The median salary for physician assistants was $104,860 in May 2017, the most recent data published by the BLS. Physician assistants work in a variety of medical settings, though most work in the offices of physicians. Other workplaces include local, private and state hospitals, outpatient care centers, and local, state, and private educational services. Emergency medicine: Emergency medicine is a high-paying specialty (the average salary, according to Verywell Health, is $116,661) that can give physician assistants a higher level of autonomy (especially in isolated or rural emergency departments). Physician assistants specializing in emergency care may diagnose and treat acute and chronic illnesses, prescribe medications, assess life-threatening health conditions, perform physical exams, and order and interpret diagnostic tests. Urgent care medicine: Like emergency care, urgent care attracts physician assistants because it often presents a level of autonomy, especially in busy and crowded walk-in clinics. According to Barton Associates, physician assistants who specialize in urgent care can make about $130,000 a year. Dermatology: Dermatology combines both the medically necessary issues like skin cancer with cosmetic elective procedures, like botox and skin peels, making for a varied and interesting specialty that also pays well. The average salary for a physician assistant specializing in dermatology is $118,145, Verywell Health reports. 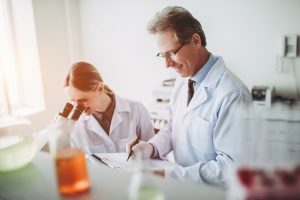 Pathology: Pathology – the study and diagnosis of disease – is one of the most popular physician assistant specialties and also the most lucrative, according to Verywell Health. Physician assistants who specialize in pathology earn an average salary of $119,000. Surgery: Surgery, and surgical subspecialties, provide physician assistants with the opportunity to treat and diagnose patients, educate patients and their families about their illness or health condition, and assist surgeons during procedures. The average income for physician assistants working in general surgery is $106,504, while the average salary for surgical subspecialties like cardiothoracic, urology, vascular, pediatric is $113,752, Verywell Health reports. While the lure of an interesting and high-paid speciality is something to consider, Barton Associates points out a downside. 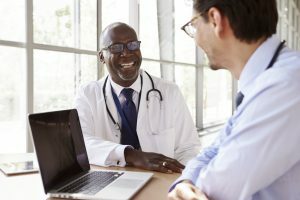 The tendency to specialize could mean that less physician assistants are willing to go into primary care, a field that the role has helped to mitigate the healthcare crisis resulting from a shortage in primary care physicians. That said, physician assistants will be in demand to fill gaps in primary care for a long time to come, as the career outlook suggests. Is Becoming a Physician Assistant Right for You? Now that you understand what the role of a physician assistant entails, the schooling and experience required, desired traits and characteristics, and the salary and career outlook, it is time to decide whether becoming a PA is right for you. If you have an interest in medicine and providing healthcare to others – you are on the right track. But there are many healthcare roles available to choose from. For example, why not become a physician or a surgeon? Or, perhaps you are also entertaining the idea of launching a career as a nurse practitioner, all of which are excellent professions to enter into. The bottom line is that it is up to you, but here are a few reasons to consider how to become a physician assistant instead of another role in the healthcare industry. In terms of how to become a physician assistant vs. a physician, one thing to take into account is there is less schooling required to start a career as a PA. Beyond an undergraduate and master’s degrees, doctors must complete three to seven years of residency before they can become licensed practice medicine independently. Becoming a physician assistant is also a lot of work, but it does not require the additional years as a resident before being able to practice. CareerBuilder points out that although physician assistants and physicians perform may of the same duties, PAs tend have more one-on-one time with patients and practice more patient-centered care, which could make the job more rewarding, depending on your interests and personality. While being a physician assistant is certainly very demanding and requires abundant flexibility, PAs are more likely to work semi-regular and shorter hours than physicians or surgeons. And when deciding between a career as a physician assistant or as a nurse practitioner, another thing to consider in addition to the differences outlined earlier in this article is that physician assistants can often administer care with more autonomy than a nurse practitioner. Whether you are looking to land your first job as a physician assistant or looking for a change, search physician assistant job listings on Provider Matching, an intelligent job board serving the Physician Assistant and Nurse Practitioner communities.